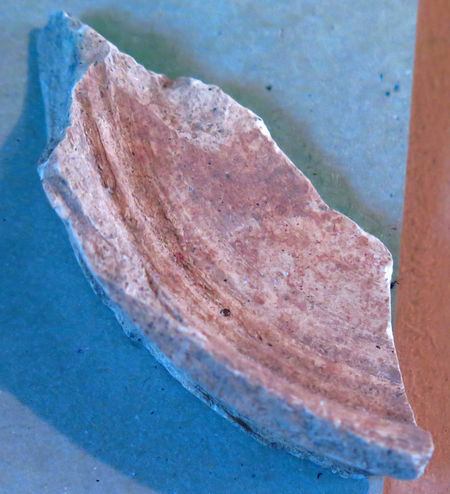 Portugal & France: Pottery Sherds at Hemyock Castle"
These sherds from imported pottery have been discovered at Hemyock Castle, in addition to many sherds from English pottery. This late medieval jug was manufactured in south west France between approximately 1300 & 1500 AD. It was probably imported and sold by wine traders. During the 16th Century, a wide range of Merida type pottery with its distinctive mica particles, was imported into England&apos;s South West. Recently, a large cache has also been discovered near Southampton&apos;s port. These particular examples are thought to have come from near Lisbon in Portugal. As well as tableware, different types of containers were manufactured by Merida type potteries. Some of these were used as containers for importing fluids, including for importing cloth dyes from continental Europe, possibly also for the West Country&apos;s cloth trade. Some small examples containing medical remedies, were found in a medicine chest in the wreck of the Mary Rose, the Tudor warship which sank near Portsmouth during a French naval raid in 1545. Sources of Hemyock Castle&apos;s Pottery: Map of Europe.